Groliffe the Ice Dragon was the treasurer of the Dragon's Friendly Society (established clerical grade.) His duty was to guard the Society's treasure by sleeping on it in an ice-cold cave in the glass mountains above the Hot water valley. Smoked out of his lair by the ever-greedy Nogbad the Bad, he inadvertantly terrorises the little people who lived there, and they dispatch Ronf to call Noggin to their rescue. 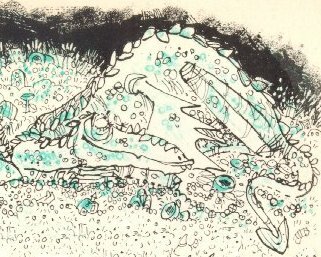 Nogbad, fleeing with the treasure, is located and frozen by Groliffe's icy breath, and the dragon settles down to sleep for another thousand years. Before he sleeps, Groliffe gives Noggin a silver gong with which to call dragons to his aid. This is to prove useful in the next saga.